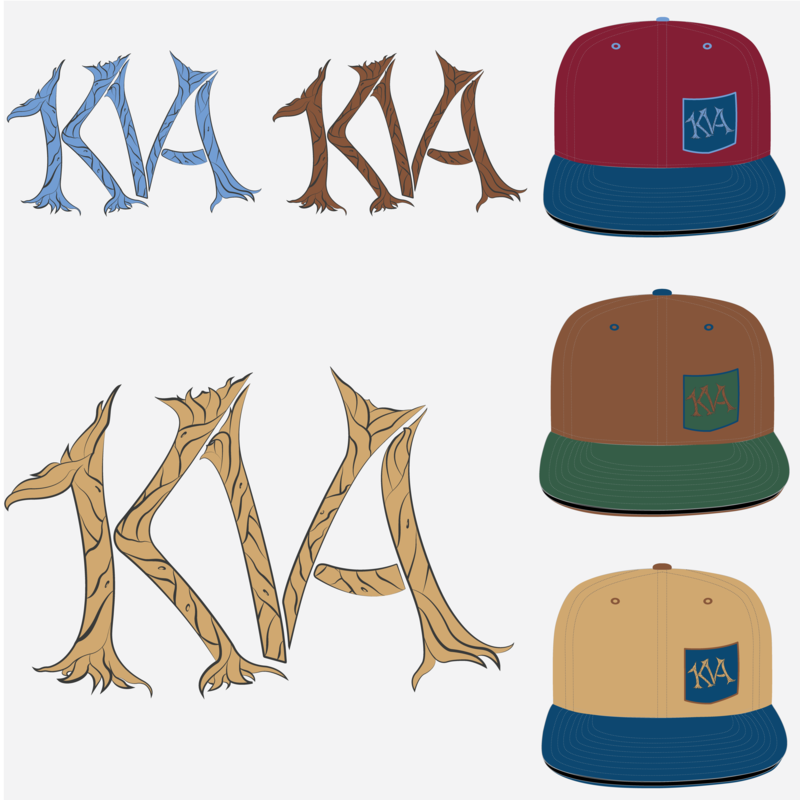 I going to start my own company this year, which is going to sell my own designed snapbacks. Now I'm just an amateur when it comes to graphic design, so I'm looking for feedback on the concept and the design. If you're interested in the back story: This snapback kinda symbolises me and my ideology. I'm gonna call the logo/company ''Roots'', hence the design. In the roots you will see the letters K,V and A, which are my initials. The concept of the roots came from my interest and respect for my past (I'm a Dutch, where my parents and grandparents come from Suriname, South America, and my great grandparents from India). So there is a lot of history there. Because of my family's journey I find it important to pay respects to the past in the broadest sense. For instance I have a lot of respect for my heritage and my (grand)parents journey. They all came from a little and worked their entire life to give the next generation more than they had. But even my story aside, I generally interested in history and different cultures. So that's why I created the concept of the roots. Do you think everyone will know the "roots" connection? I for one wouldn't have known this if you hadn't explained it. It's not even immediately obvious to me that the letters are supposed to be roots. At first look, it reminded me of woven straw or something. Will the design look good at the size you want to reproduce it? It has some intricate detail made up of fine lines, which will get even finer if you reduce the size of it. Such designs should really look good at any size. How will the image be applied to the baseball cap? Depending on the method of printing/applying the image, e.g. embroidery or screen printing, some of those fine lines might not be very visible or even lost completely. To alleviate the potential problems of points 2 and 3, perhaps you could consider a simplified design, and thicken up the lines. Logos should relate the company and not who may be in charge or the owner in most cases. Imagine if LucasArts used a logo that was "GL"
If Virgin Airlines used a logo that was "RB"
Facebook's logo was merely "MZ"
While you may know the connection these initials have, the general public will have no clue. Using some remotely connected initials for a logo of the company merely provides complete brand confusion for the viewers/public. If your company name is "Roots" then the logo should be for "Roots" and not "KVA". No one will know what KVA is or more critically, how to find the company based upon "KVA". What if someone really likes what you've done and wants to buy more stuff.. how will they find "Roots" if all they know is "KVA"? The only time using a person's name for the logo is acceptable is if the company is named after that person - a la Ford, Disney, Hilfiger, etc. In addition, the root drawings inside the shapes will most likely not hold up under many reproduction methods. There's too much detail and, at a reduced size, maintaining that detail will prove difficult. Especially for things like embroidery on a cap. I'm going to add that when I consult with clients for corporate identity development, typically well before we get to specifics of a logo design, we go through a process in which they / we assess things like company mission, values, capabilities and company culture, company history / bio, the company's planned longevity / partnership buyout plans, market differentiation (what makes the client's service or widget different / better / distinct from competitor's offerings) and so on. The reason for the corporate longevity discussion is that it makes a huge difference if a company is envisioned as being a 100-year firm versus a personality firm whose image is intrinsically tied to a founding member. From this we postulate what the corporate identity must communicate to the market as a whole and to prospective clients, partners, vendors and customers, both directly and through impression, and these all then inform potential logo design ideas, colour schemes, typography, motion graphic motion schemes, written copy and so on. It's a rare business type indeed which truly benefits from having the firm's name or logo directly tied to a founder's name, and most of those are in the highly technical professional services sectors (architecture, law, and medicine, for example) where that is in fact expected. I think you might benefit from going through some of those discovery exercises before starting design ideation - you may find you get far stronger results if you have a thesis behind what you're trying to do, beyond "I gotta have a logo".